Former altar servers and parents: We are looking for old cassocks that are no longer being used. So, check your closets and drawers to see if you can turn one in and help us out!! Please turn them into the altar server closet. Thank you. 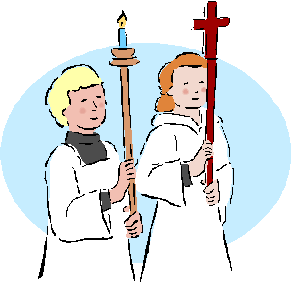 Parents with children interested in becoming an altar server should contact Jim McKay at Jim McKay and John Nelson at John Nelson for information and to schedule training. All individuals who have completed their First Holy Communion and are of good faith are welcome and encouraged to become an Altar Server. (1) to provide altar servers at all weekend masses and to standardize the number of servers at each mass, (2) to provide adequate training so that servers are successful in their role, and (3) to develop future Catholic leaders. Altar Server Council: The Altar Server Council consists of co-leaders Jim McKay and John Nelson, a Chaplain (Deacon Ed Krise and Deacon Rick Medina), a Scheduling, Communications and Mass Coach Coordinator (Nina Welde), a Vestry Coordinator (Brandi Kler), a Training Coordinator (Kelly Powers), and a Social Events Coordinator (Dawne Cueller). New servers application form: Individuals interested in becoming an altar server are required to complete an application to enroll into the program. Applications are accepted between April 1 and May 31, annually (and occasionally based on church needs). Service levels: Service levels: Altar servers advance through 5 Service levels: Apprentice, Novice, Skilled, Master, and Guardian. Service level is based on age, grade, and demonstrated competency. Orientation, training, and assessment process: A new Altar Server Training Manual has been developed and is now available on line. New servers are required to complete this manual as well as a parent guided self-study module, and hands on training session prior to serving. Annual promotion opportunities and Commissioning Mass: Depending on their age and grade level, servers may be considered for promotion each year. If eligible, promotion candidates must complete additional training and self-study modules pertaining to the rank they are trying to achieve. They will also be observed serving a mass to determine their competency for the next level. Promotions will be granted during a Commissioning Mass – held annually in November. Server recognition activities: Servers will be recognized in a number of ways throughout the year, (e.g. Photos will be placed in the vestibule quarterly; names will be announced at the beginning of mass, various social activities). Scheduling process using Sign-up Genius: Servers will be assigned to teams of 3 and scheduled (on a rotating basis) to serve at all (non-holiday) weekend masses. A maximum of 6 servers will be permitted to serve at any given mass. Additional servers will sit in the first pew to the left of the altar. Vestry: Apprentice servers will only wear black cassock (no white surplice) until they are promoted to Novice. Novice Servers will wear a black sash, Skilled Servers wear a red sash, Master Servers will wear a red sash with gold trim, and Guardian Servers will wear a gold sash. Mass coach: Each weekend Mass is assigned an Altar Server team, each team also has an assigned Mass Coach. This adult individual is there to support and offer feedback to the servers as they perform their server duties. Mass Coaches MUST complete the VIRTUS safe environment training and submit to a background check (good for 5 years) as mandated by the Archdiocese of Atlanta. If you have any questions regarding the program, please contact Jim McKay and/or John Nelson. Children who have made their First Communion are welcome to join the Altar Server Ministry. We do provide training on an annual basis. Please see the Altar Server Training Manual link below for information on training and altar server scheduling.